Tacca chantrieri is a perennial plant belongs to Taccaceae family that has the potential to be marketed as an ornamental plant due to its unique shape and dark color inflorescence. To date, very limited publication on T. chantrieri are available. The aim of this research was to examine plant growth pattern and flower phenology of T. chantrieri from West Borneo, Indonesia, and from Queensland, Australia in relation to their potential development as ornamental pot plants. The study was extended to examine T. chantrieri seed morphology with an inclusion of an accession from Thailand. The field experiment was conducted at the Leuwikopo experimental station in Darmaga, Bogor, Indonesia. Seed morphology examination was conducted at the Histology Laboratory of Department of Agronomy and Horticulture, Faculty of Agriculture, Bogor Agricultural University. T. chantrieri from West Borneo blooms six times a year whereas the Queensland accession twice a year. West Borneo accession had smaller bractea, fewer numbers of flowers per inflorescence and shorter flower stalk than Queensland accession. In addition, T. chantrieri Queensland grew faster than Borneo with the one leaf formed every two to three weeks, whereas it was at least four weeks in the Borneo accession. Both accessions were susceptible to leaf brown spot disease caused by Cercospora taccae. T. chantrieri Queensland seeds are oval dark brown, whereas West Borneo and Thailand accessions were shaped like kidneys (reniform) with a lighter brown color. This study demonstrated that there is great diversity in T. chantrieri including plant morphology, seed shape and color, which are important for species identification and for development of T. chantrieri as ornamental pot plant. Charoensub, R., Thiantong, D., and Phansiri, S. (2008). Micropropagation of bat flower plant, Tacca chantrieri Andre. Kasetsart Journal of Natural Science 42, 7-12. Elle, E., Gillespie, S., Guindre-Parker, S., and Parachnowitsch, A. L. (2010). Variation in the timing of autonomous selfing among populations that differ in flower size, time to reproductive maturity, and climate. American Journal of Botany 97, 1894-1902. Fu, L.K. and Jin, J.M. (1992). “China Plant Red Data Book, Rare and Endangered Plants”. Science Press, Beijing. Hunter, D.G., and Shafia, A. (2000). Diseases of crops in the Maldives. Australasian Plant Pathology 29, 184-189. Jackson, G. (2016). “Pacific Pests and Pathogens Fact Sheet: Arrowroot Leaf Spot”. Queensland Centre for International Agricultural Research. Canberra. Kohler, F., Pellegrin, F., Jackson, G., and McKenzie, E. (1997). “Disease of Cultivated Crops in Pacific Island Countries”. South Pacific Comission, Pirie Printers Pty. Ltd. Canberra. Krisantini, Wiendi, N.M.A., and Palupi, E.R. (2017). Evaluation of horticultural traits and seed germination of Tacca chantrieri ‘André. Agriculture and Natural Resources, 1-4. Putri, Y.N.Q. (2016). “Studi Fenologi dan Pengecambahan Benih Tacca chantrieri Andre”. [Thesis]. Institut Pertanian Bogor. Steinrut, L., Itharat, A., Ruangnoo, S. (2011). Free radical scavenging and lipid peroxidation of Thai medicinal plants used for diabetic treatment. Journal of Medical Association Thailand Suppl. 7: S178-182. Sulong, N.A., Athirah, A., Aishah, A., and Sidik N.J. (2013). 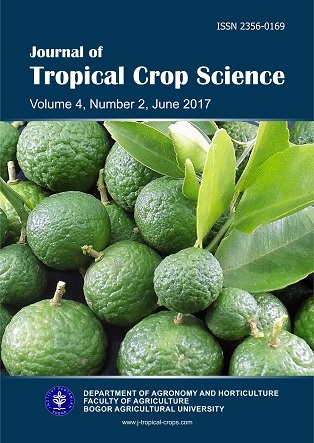 Optimization of plant growth hormones for in vitro seed germination of Tacca integrifolia. In: ISBEIA Conference; Serawak, Malaysia. Wawo A.H., Lestari P., and Utami N.W. 2015. Studi perbanyakan vegetatif tanaman taka (Tacca leontopetaoides Kuntze) dan pola pertumbuhannya. Berita Biologi 14, 1-9. Wright, J.G., Pelasio, M., and McKenzie, E.H.C.(2005). “Weeds and Plant Pathogenic Fungi and Viruses in Tokelau. Secretariatë of the Pacific Community. Suva. Yokosuka, A., Mimaki, Y., Sashida, Y. (2002). Steroidal and pregnane glycosides from the rhizomes of Tacca chantrieri. Journal of Natural Products 65, 1293–1298. Zhang, L., Chen, J., Li, D.Z., and Li, Q.J. (2007). Reproductive biology, mating system, and population genetics of devil flower: autonomous selfing plant with showy floral display. Floriculture and Ornamental Biotechnology 1, 115-124. Zhang, L., Barrett, S.C.H., Gao, J.Y., Chen, J., Cole, W.W., Liu, Y., Bai, Z.L., Li, Q.J. (2005). Predicting mating patterns from pollination syndromes: the case of "sapromyophily" in Tacca chantrieri (Taccaceae). American Journal of Botany 92, 517-524. Zhang, L., Li, Q.J., Li, H.T., Chen, J., Li, D.Z. (2006). Genetic diversity and geographic differentiation in Tacca chantrieri (Taccaceae): an autonomous selfing plant with showy floral display. Annals of Botany 98, 449–457.